We believe that multifunction is elegant and economical. For example, by installing a piece of solar glass in a facade, you pay for the material once, and have it serve two functions - in this case, as cladding and power generator. 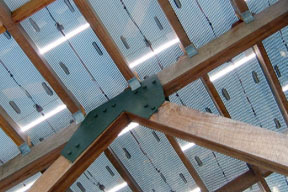 Building surfaces - roofs and facades - offer great integrative opportunities since they are inherently multifunctional. Like a biological skin, building skins provide shelter from weather, thermal insulation, admit light and views, provide access and security. In most buildings, the relationship between a building skin and natural elements (the sun, rain and wind) is essentially defensive and negative, as evidenced by words like weather proof, water repellent, etc. In many cases, however, it is possible for the building skin to work positively with or leverage natural elements, by harvesting energy, collecting rainwater, by providing living habitat or growing food. Our earliest work in the 1980s involved developing some of the world's first building integrated photovoltaic applications. Originally, these were projects to showcase the products of solar manufacturers. but we found that solving specific technical problems related to solar technology brought other benefits to the buildings. By extension, optimizing applications for a solar panel led to opportunities in daylighting, sun control, thermal harvesting, etc. Plants are solar devices too, and in recent years we have become interested in ways to integrate living elements into buildings. Green roofs, living walls, and integrated food production have enormous potential for multiple, integrated benefits to buildings and the people who occupy them, in terms of energy, water, air quality, nutrition, habitat creation, and psychological health. And many of these technologies can work together, as in a green roof which includes rainwater collection and photovoltaic generation.